Gary B. Goolsby, ’73, Senior Managing Director for FTI Consulting, will deliver “A Journey of Work Ethic Through Ethics” as part of the 13th annual William Ardis Marbury, Jr. and Virginia Lomax Marbury Lecture Series at 11 a.m. Tuesday, Sept. 18, in Howard Auditorium on the Louisiana Tech University campus. Sponsored by the Mr. and Mrs. Lou C. Napper Family and hosted by the College of Business and Cedar Creek School, the lecture is free and open to the public. Goolsby will share the story of his career path—beginning with his educational foundation from Louisiana Tech University and evolving to roles as audit and leadership partner, forensic investigator, and expert witness in major firms. A career is a journey—not a sprint—and keeping an ethical focus on the journey is essential. Goolsby notes that while everyone faces challenges, the key is in how we deal with these challenges. He will also discuss how never giving up, learning from good and bad experiences, dedication, sacrifice, persistence, a positive attitude, and strong moral compass result in a rewarding life both professionally and personally. Based in Houston, Texas, Goolsby currently serves as a Senior Managing Director in the Forensic and Litigation Consulting segment at FTI Consulting, a global business advisory firm dedicated to helping organizations manage change, mitigate risk, and resolve disputes. 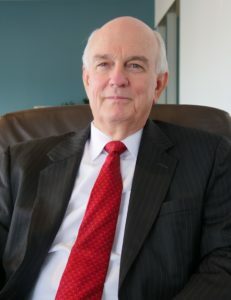 His experience spans over four decades and includes work in accounting and auditing, risk management, resolving auditor malpractice allegations, investigations, governance, internal controls and business processes, board of directors and regulatory interactions, executive management, expert witness testimony, and case consultancy and technical presentations. Goolsby has provided professional services to numerous industries including oil and gas exploration, development, services, refining; mining; financial institutions including brokerage, banks, savings and loans, mortgage banking, insurance; construction and real estate. Goolsby’s experience, much of which was gained during crisis periods for the U.S., includes involvement in the resolution of issues including whistleblower allegations, alleged fraud, management integrity and credibility, internal control weaknesses, SEC and financial institution regulatory filings, and alleged illegal acts (including anti-corruption), among many others. He earned a bachelor of science in accounting and master of business administration from Louisiana Tech University. In 1998, Goolsby was named the College of Business Distinguished Alumnus of the Year. For more information on the Marbury Lecture Series, contact College of Business Senior Director of Development Mary Susan Britt at marysusan@latechalumni.org. The William Ardis Marbury, Jr. & Virginia Lomax Marbury Lecture Series began in 2006 and is named after William Ardis Marbury, Jr. and his wife Virginia. The pair, both Louisiana Tech graduates, established William A. Marbury & Company, Inc., a managing general insurance agency. This corporation grew to be the largest agency in Louisiana, and one of the largest in the South. The general agency was sold in the 1950s to Commercial Union Insurance Company with the Ruston branch remaining the company’s largest in the country. In 1959, the Marburys and their associates founded Bankers Life of Louisiana, which became the largest credit life insurance writer in the state. Today the Marbury Companies continue to thrive in Ruston, serving the banking, investment, and insurance sectors. The companies founded by the couple continue to have a major impact on the economy and the community.